The 2019 MJG International Festival took place on Saturday 9th of March. 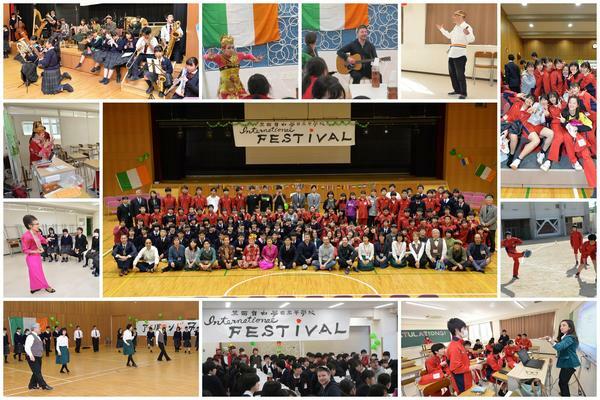 The festival has continued to grow and this year it became an official school event. It was attended by 128 students from the 1st grade Sogo Course and by about 60 students from the brass band. With the increase of students, the number of international workshops also increased from three to six. This year we were delighted to have Peggy Febriani from Indonesia, Piyaratt Kawai from Thailand, Catalina Arce Ferrada from Chile, Vlad Maxim from Romania and Kym Lambden from Australia to lead workshops from their countries. Mr. Lambden was supported by Connor Scullion and Gavin Kealy from Ireland. Every year we are so lucky to have Irish musicians and dancers to come and teach and perform live for us. This year was no exception and we were graced with the talent of Masaya Takahama on the bodhran (Irish hand drum), Shigeto Asao on guitar, Tomoyo Honda and Kazuhisa Yoshida on fiddle (violin), Mai Hotta and Harumi Yamamoto on concertina, Tomohiro Koike on flute, Hiromi Takahama on banjo and Ashi Yamamoto on the uilleann pipes (Irish bagpipes kept inflated under the elbow). We also had the pleasure of welcoming an Irish dancing group of Yoshitake Uematsu, Ai Ishii, Yumi Nisha and Mika Yamamoto. After the students had taken part in two of the above workshops, everyone gathered in the cafeteria for a meal of Irish stew. After the meal Peggy performed an exotic Bali dance and Catalina and Gavin played the guitar and sang songs in English and Spanish. We would like to take this opportunity to thank all the teachers who helped with preparing and lending equipment to make this event a success. Especially we would like to thank the English Room staff of Hiroko Miyagi and Yu Kagata for their constant support and advice. We now look forward to a bigger and better event next year.